Back in the days of John Cage and Frank Zappa, and Stephen Sondheim finding his voice, there were families who had an uncle or neighbor who owned this weird car called a Citroën DS—maybe they owned one themselves. Viewed with either love or distain, the car grabs the eye and mind. The philosopher Roland Barthes in "Mythologies" (1957) discerned something profound about the car: "It is obvious that the new Citroën has fallen from the sky inasmuch as it appears at first sight as a superlative object." The 1964 Car and Driver review for the car had it parked under a billboard for Carl Reiner's "Enter Laughing." Ultimately, Barthes could not fully accept the Déesse's divinity where an automotive critic was converted. The two of us both come from families who had an uncle with a Citroën, and count ourselves among the faithful. Our courtship 39 years ago started with the purchase of 1972 Citroën DS21 Pallas. So what the devil does this obsession have to do with farming? Anthony in his trusty steed. 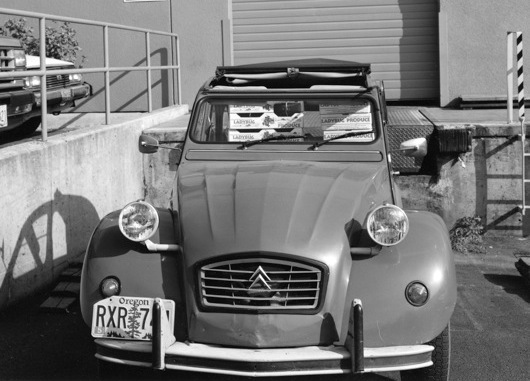 The connection starts in 1936, when Pierre Boulanger, the chief of Citroën, started a project coded TPV for toute petite voiture, or a completely small vehicle. It was conceived as a car for farmers. The design team included Citroen's Italian sculptor, Flaminio Bertoni, and André Lefèbvre who arrived at the company with a background in engineering airplanes. The team was under the stern direction of Boulanger. The so-called War to End All Wars had decimated the male population—a whole generation of French farmers were buried—so the efforts of women and their children were important for feeding the nation. Boulanger's design brief called for a car that could be "drivable by a woman or by a learner driver." The brief also called for a vehicle that could haul four people and a 110-lb. sack of potatoes at 36 mph, and travel 78 miles on a gallon. The sculptor was told that appearance didn't matter, merely an umbrella with wheels would suffice. Most importantly and famously, the suspension had to be gentle enough that the farmer could carry a market basket containing a gross of eggs (144) to market without breaking a single one, even after passing over the roughest farm roads and cobblestone streets. A fabric top could be rolled back to accommodate bulky items such as a ewe or calf. Early brochures featured livestock in the car, as well as eggs and baskets of vegetables. Delivering 40 flats of berries. The design was driven by economy, practicality and simplicity. The original was minimalist in every respect. The prototype started out with a two-cylinder BMW motorcycle engine. After several other sorts were tried, the air-cooled engine based on the BMW design was adopted, giving the car its characteristic whine. Every part was repeatedly weighed and pared to make sure it was as light as possible. The gearbox reflects Boulanger's fixation on farmers. He was insistent on a three-speed gearbox, but his design team developed a four-speed box. 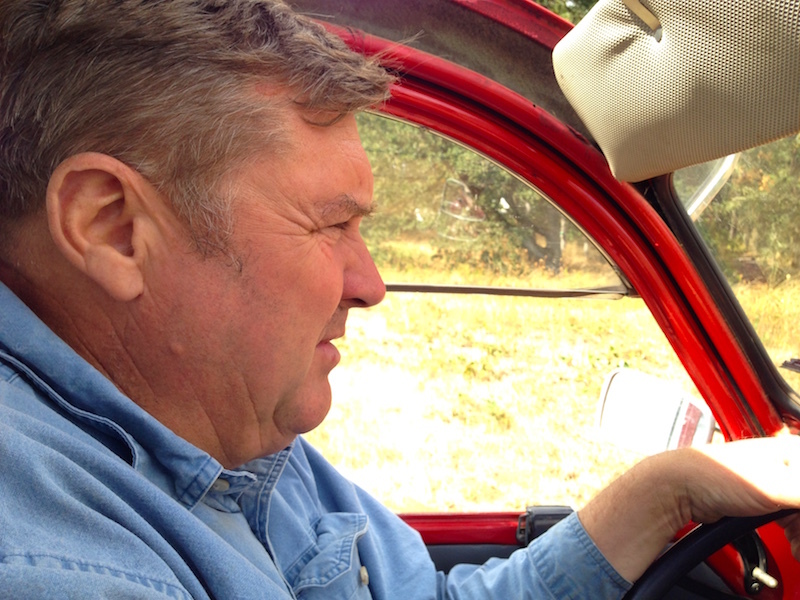 He was indignant, what does a farmer need with so many speeds? Stymied for a while and on the verge of loosing the argument, the team came up with a farmer's story. After market, the load is light but a farmer needs to get back to feed the chickens and milk the livestock; night is hastening and she needs a supplemental speed to reach her farm by the last shred of light. The chief relented and the early models were marked 1, 2, 3, S, retaining a modicum of deference to his plan. The lawn mower style starter cord was dropped in favor of a starter, preferred by the team, when the women testers complained. Bertoni created a spacious car with an abundance of constant radius curves friendly and gentle in spirit, not an inkling of aggression. In various languages it quickly became known as the snail or duck. Hauling equipment with co-pilots Nutmeg and Bella. 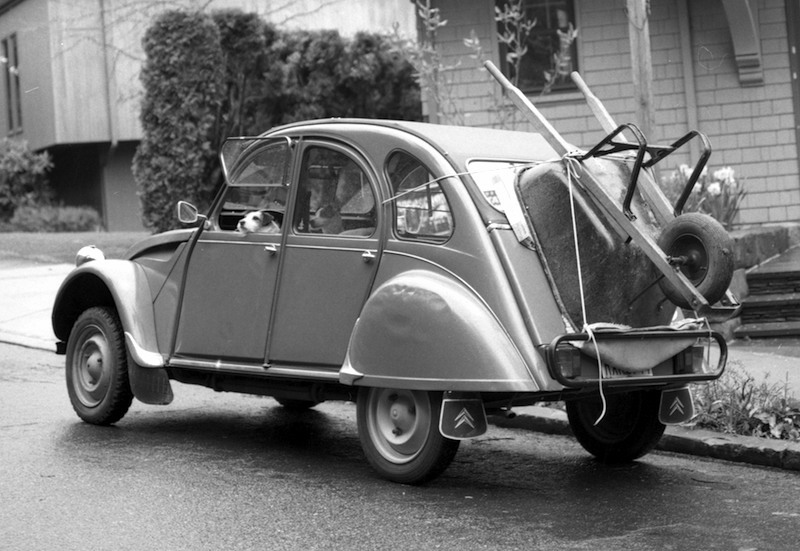 Development was interrupted by the war, and the first 2CV (Deux Chevaux) was finally introduced in 1948. The models in the 1950s had a 14-horsepower engine. The French authorities taxed cars by the engine's fiscal horsepower—equivalent to seven horsepower in the US and elsewhere – so at two fiscal horsepower it was very cheap to license. Despite the design emphasis on the farmer, the car was universally accepted and produced continuously until July 1990. That final car was still effectively an umbrella with wheels, with hammock seats and an underpowered, whining two-cylinder engine. Along with that artfully tuned suspension that would never hurt an egg. The car was still easy to service and repair. There was a collective groan from 2CV owners when Richard Dreyfus in American Graffiti could not start his 2CV. All he had to do was open the trunk and pull out the hand-crank that Boulanger insisted should be included, and was until the very last car rolled off the line. When James Bond ignores the switchbacks and careens straight down a slope in a 2CV, escaping his would-be assassins in their fancy, high-powered cars, we chuckle approvingly. Indeed, Citroën produced a limited edition 007 model, and ignored the Dreyfus faux pas. 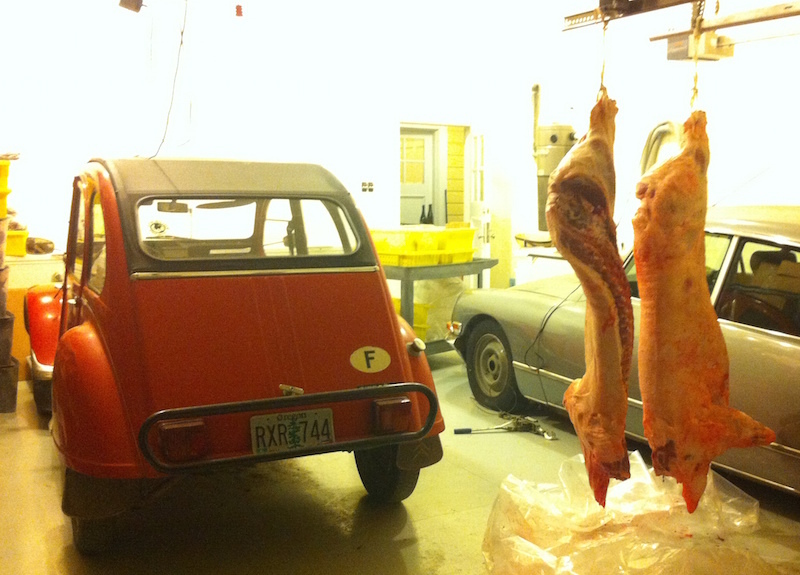 A 2CV, a farmer's car, without a hand-crank, never. Although Citroëns are singular cars, ownership is not always so. 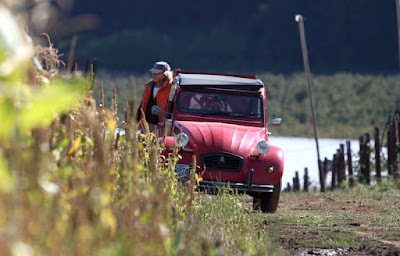 In our case, a 2CV edged its way into our lives 25 years ago, and is still used by us at the farm. Chances are, the tomatoes, onions or other vegetables you all bought at market were hauled out of the field in that "tin snail," keeping Boulanger's vision alive in Gaston of all places. On occasion we make delivery runs to Portland in the car. Even though we use a piece of history to bring your tomatoes from the field, you still get them at the same great price. Imagine that. Times have changed, though. The first decade we had the car, veterans would come up to us and recount a similar warm memory. They and a buddy borrowed or rented a 2CV, packed some sausage, bread and wine and took a trip into the European countryside with a couple of…the memory trails off into a wistful smile when it no longer relates to the car, nor did it ever. Shades of the Gary Gentry classic "The one I Loved Back Then": "…the old man scratched his head, and then he looked at me and grinned, he said son you just don't understand, it ain't the car I want, it's the brunette in your 'vette…"
Car lovers and foodies have got to love this post!!! I know my husband, an inveterate "car guy" (and Citroën admirer), did, Joseph, thanks!